The U.S. tech landscape would look very different without immigrants, according to a new internet trends presentation by Mary Meeker, an influential tech analyst and venture capitalist. 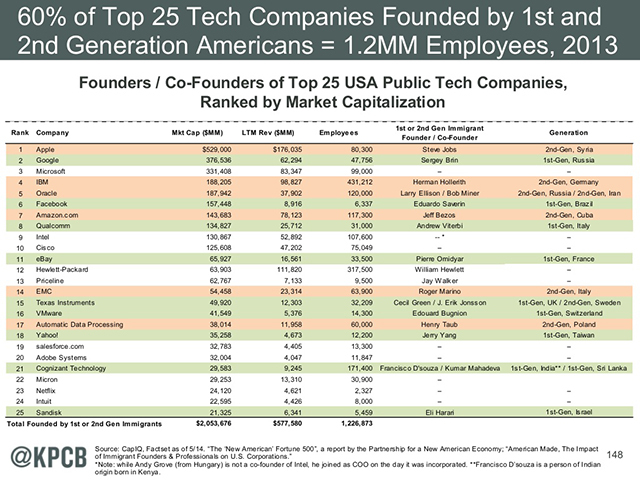 Of the top 25 tech companies (by market capitalization), 60% have founders who are immigrants or have at least one immigrant parent. 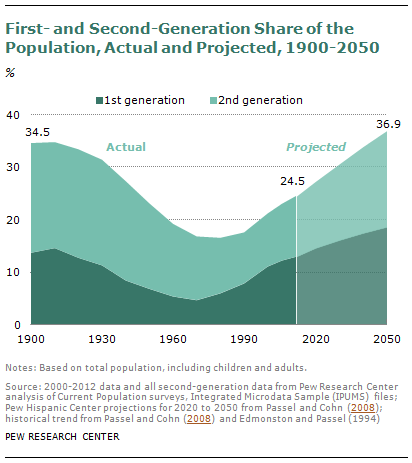 The chart uses a broad definition of first- or second-generation immigrants, but it brings a fresh perspective and analysis to how we typically think about the impact of immigrants to the United States. Meeker’s list includes some of the biggest names in tech: Apple co-founder Steve Jobs (son of a Syrian immigrant, but raised by U.S.-born adoptive parents), Facebook co-founder Eduardo Saverin (Brazilian immigrant) and Google co-founder Sergey Brin (Russian immigrant). For years, the nation’s biggest technology companies have lobbied to increase the number of skilled immigrants allowed to legally work in the United States. The Obama administration earlier this month announced plans to let spouses of some highly skilled immigrants work. But an immigration reform bill that would affect both low- and high-skilled immigrants has stalled in the House since its passage in the Senate last year. There is some support for the move among the public. Roughly half of Asian Americans (47%) and Hispanics (52%) said giving more temporary work visas to high-skilled workers would help the U.S. economy “a great deal,” according to an October 2013 Pew Research Center survey. Less than one-in-five Hispanics (19%) and Asian Americans (17%) said doing so would not help the economy. In 2012, the top countries of birth for recipients of H1-B visas issued to high-skilled workers are, in descending order: India, China, Canada, Philippines and South Korea. The United States is by far the world’s top destination for immigrants. The U.S. has more than 40 million immigrants, accounting for 13% of the population – about the same percentage as a century ago. Today, one-in-four of the U.S. population are either immigrants or have at least one immigrant parent. It’s worth noting, however, that none of the tech executives listed in Meeker’s chart have roots in today’s top countries sending immigrants to the United States. Of all immigrants, 29% (or 11.7 million) were born in Mexico. Other top countries, in descending order are: China, India, Philippines and Vietnam.